On Sunday evening, several hundred Albuquerque, NM community members gathered at the African-American Performing Arts Center for a vigil to remember the nine African-Americans murdered by a white supremacist vigilante at the African Methodist Episcopal church in Charleston, South Carolina last Wednesday, June 17. Our statement of solidarity issued at Sunday’s vigil recognizes the murders as an act of political terror historically rooted in slavery and genocide. These two structures persist in framing contemporary U.S. racism and the ongoing colonial occupation of Indigenous lands. The Red Nation pays attention to and stands with the growing movement, such as #BlackLivesMatter, that has coalesced in the aftermath of the uprisings against state-sponsored anti-Black violence in Ferguson, MO and Baltimore, MD. 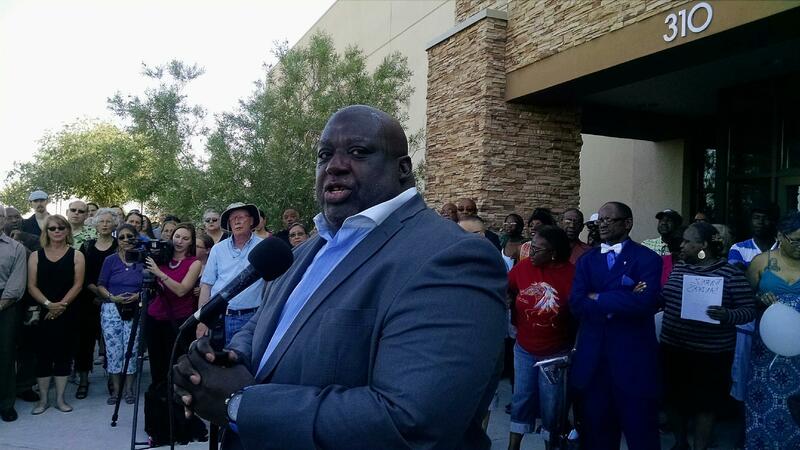 Bishop David Cooper of the New Hope Full Gospel Baptist Church, the largest African-American church in Albuquerque, stated at Sunday’s vigil, the Charleston killings were “Blacklash,” or a backlash against Black communities for standing up against the injustice of structural and systemic white supremacy. There is an increasing offensive response against a perceived sense that social justice movements are laying siege to the sanctity of whiteness. White supremacist groups, though touted as marginal and fringe by the media, are armed, well-organized, and networked across the country. As we have witnessed over the last several years, they have escalated acts of racial terror against Black, Muslim, migrant, and Native communities. If left unchallenged by a united and well-organized coalition, acts of racial violence and backlash, from both vigilantes and state institutions, like the police and military, will only increase. For example, the National Guard, armed with assault rifles, were deployed in both Ferguson and Baltimore against Black communities to protect private property, not Black lives. It is time for Native people to further commit to the long, hard process of working across racial, class, gender, sexual, religious, regional, and ethnic difference. As stated in The Red Nation Manifesto, we are a coalition of Native and non-Native activists and community organizers. We understand Native liberation can only be achieved through meaningful and generative collaboration with all oppressed peoples. Our liberation is bound to yours. There are no words that can describe the grief and anger we feel for Wednesday’s act of racial terror inflicted upon the African Methodist Episcopal (AME) church in Charleston, South Carolina and the broader African-American community. As members of the Albuquerque community, the ANSWER (Act Now Stop War End Racism) Coalition and The Red Nation extend our deepest sympathies and support to the victims’ families and the larger African-American community that strive for justice. Major news outlets have been reluctant to call the tragedy what is—an act of racial terror. But there is always reason behind tragedy. Given the AME’s historical significance in Charleston as a site of a planned slave revolt in 1822 and a location for political civil rights organizing in the twentieth century, Wednesday’s attack is neither accident nor coincidence but planned and politically calculated. It speaks to the methodic anti-Blackness of the U.S. in our present moment, as Black lives are systematically murdered by police and vigilantes with impunity and incarcerated at rates that far surpass ALL nations of the world. As a coalition of Native and non-Native activists, The Red Nation recognizes that this country is built on the genocide of Native people and the theft of their lands as well as the displacement and enslavement of African peoples. These are not mutually exclusive histories. The genocide of Native peoples and the enslavement of African peoples worked in tandem to erect a system built on white supremacy, racial capitalism, and settler colonialism—a system we have yet to overcome and which we struggle to liberate ourselves from. Only through the unity and collective action of Native and Black peoples with all oppressed peoples can we strive to build a more racially and politically just future. Today, we extend our hands in support and express our deepest sympathies with the AME church and the African-American Community. We grieve with you and stand beside you.